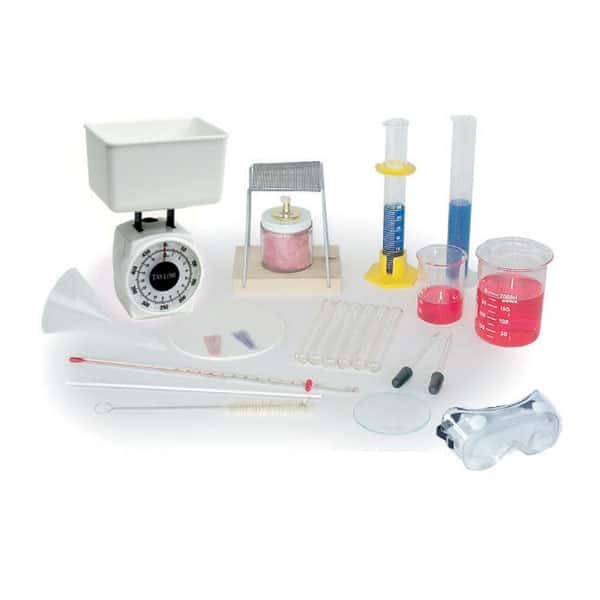 Save 15% when you purchase the Exploring Creation with Chemistry 3rd Edition Superset! This set contains Apologia's Exploring Creation with Chemistry 3rd Ed. Textbook, Test & Solutions Manual, Student Notebook, MP3 Audio CD, and Video Instruction DVD. Our award-winning high school chemistry course is now better than ever! This revised edition offers more in-depth discussions and explanations of concepts, as well as biographical sketches of Christian scientists who have made a difference in the field while giving the glory to God. This course provides a rigorous foundation in chemistry in order to prepare your student for college-level studies. This SuperSet includes five items from Apologia's Exploring Creation with Chemistry, 3rd Edition product line: the textbook, tests & solutions manual, student notebook, MP3 audio CD, and video instruction DVD. We recommend that students taking this course be proficient at an algebra math level. Topics include significant figures, units, classification, the mole concept, stoichiometry, thermochemistry, thermodynamics, kinetics, acids and basics, redox reactions, solutions, atomic structure, Lewis structures, molecular geometry, gas laws, and equilibrium. Experiments include measuring specific heat, discovering the electrical conductivity of compounds dissolved in water, measuring the width of a molecule, exploring freezing, point depression, using the ideal gas equation, recognizing the effects of catalysts, and much more. This high-quality, spiral-bound notebook will help your student be more independent and organized. The notebook contains a daily schedule, note-taking pages, instruction in the Cornell notetaking system, and all of the questions found in the text with room to answer these questions. Additionally, lab report pages enable students to meticulously document their laboratory work in a manner that prepares them for college lab studies. Going beyond the text, the student notebook also instructs students in creating and interpreting line graphs from data, an essential skill all students need to thrive in science. This CD contains a complete audio recording of the course Exploring Creation with Chemistry 3rd Edition as read by Marissa Leinart. This is the perfect accompaniment to the book for students who are auditory learners, slow readers, or have other learning disabilities that make reading difficult. Want to explain the substance of everything that you can see and even things that you can’t see in a manner that is easy to understand? Enhance your student’s chemistry course with this outstanding video instruction DVD with over 20 hours of engaging instruction, featuring Apologia author and scientist Sherri Seligson. Using on-location video footage and animated diagrams, Sherri investigates the properties of matter and the many ways in which matter interacts, combines, and changes into new substances. Understanding the natural world around us has never been more fun. This video instruction DVD was created specifically for students using Apologia’s award winning curriculum Exploring Creation with Chemistry, 3rd Edition.